Liczba stron: 766 Jest to ujednolicona liczba stron, która ułatwi Ci porównanie długości książek. Każda strona Legimi to 200 słów. 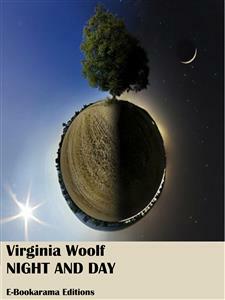 Virginia Woolf's delicate second novel is both a love story and a social comedy, yet it also subtly undermines these traditions, questioning a woman's role and the very nature of experience.Katharine Hilbery is beautiful and privileged, but uncertain of her future. She must choose between becoming engaged to the oddly prosaic poet William Rodney, and her dangerous attraction to the passionate Ralph Denham. As she struggles to decide, the lives of two other women - women's rights activist Mary Datchet and Katharine's mother, Margaret, struggling to weave together the documents, events and memories of her own father's life into a biography - impinge on hers with unexpected and intriguing consequences. The young man shut the door with a sharper slam than any visitor had used that afternoon, and walked up the street at a great pace, cutting the air with his walking-stick. He was glad to find himself outside that drawing-room, breathing raw fog, and in contact with unpolished people who only wanted their share of the pavement allowed them. He thought that if he had had Mr. or Mrs. or Miss Hilbery out here he would have made them, somehow, feel his superiority, for he was chafed by the memory of halting awkward sentences which had failed to give even the young woman with the sad, but inwardly ironical eyes a hint of his force. He tried to recall the actual words of his little outburst, and unconsciously supplemented them by so many words of greater expressiveness that the irritation of his failure was somewhat assuaged. Sudden stabs of the unmitigated truth assailed him now and then, for he was not inclined by nature to take a rosy view of his conduct, but what with the beat of his foot upon the pavement, and the glimpse which half-drawn curtains offered him of kitchens, dining-rooms, and drawing-rooms, illustrating with mute power different scenes from different lives, his own experience lost its sharpness. "She'll do… . Yes, Katharine Hilbery'll do… . I'll take Katharine Hilbery." Although thus supported by the knowledge of his new possession of considerable value, he was not proof against the familiar thoughts which the suburban streets and the damp shrubs growing in front gardens and the absurd names painted in white upon the gates of those gardens suggested to him. His walk was uphill, and his mind dwelt gloomily upon the house which he approached, where he would find six or seven brothers and sisters, a widowed mother, and, probably, some aunt or uncle sitting down to an unpleasant meal under a very bright light. Should he put in force the threat which, two weeks ago, some such gathering had wrung from him—the terrible threat that if visitors came on Sunday he should dine alone in his room? A glance in the direction of Miss Hilbery determined him to make his stand this very night, and accordingly, having let himself in, having verified the presence of Uncle Joseph by means of a bowler hat and a very large umbrella, he gave his orders to the maid, and went upstairs to his room. "Mother says, aren't you coming down, Ralph? Uncle Joseph—"
"They're to bring my dinner up here," said Ralph, peremptorily; whereupon she vanished, leaving the door ajar in her haste to be gone. After Denham had waited some minutes, in the course of which neither he nor the rook took their eyes off the fire, he muttered a curse, ran downstairs, intercepted the parlor-maid, and cut himself a slice of bread and cold meat. As he did so, the dining-room door sprang open, a voice exclaimed "Ralph!" but Ralph paid no attention to the voice, and made off upstairs with his plate. He set it down in a chair opposite him, and ate with a ferocity that was due partly to anger and partly to hunger. His mother, then, was determined not to respect his wishes; he was a person of no importance in his own family; he was sent for and treated as a child. He reflected, with a growing sense of injury, that almost every one of his actions since opening the door of his room had been won from the grasp of the family system. By rights, he should have been sitting downstairs in the drawing-room describing his afternoon's adventures, or listening to the afternoon's adventures of other people; the room itself, the gas-fire, the arm-chair—all had been fought for; the wretched bird, with half its feathers out and one leg lamed by a cat, had been rescued under protest; but what his family most resented, he reflected, was his wish for privacy. To dine alone, or to sit alone after dinner, was flat rebellion, to be fought with every weapon of underhand stealth or of open appeal. Which did he dislike most—deception or tears? But, at any rate, they could not rob him of his thoughts; they could not make him say where he had been or whom he had seen. That was his own affair; that, indeed, was a step entirely in the right direction, and, lighting his pipe, and cutting up the remains of his meal for the benefit of the rook, Ralph calmed his rather excessive irritation and settled down to think over his prospects. This particular afternoon was a step in the right direction, because it was part of his plan to get to know people beyond the family circuit, just as it was part of his plan to learn German this autumn, and to review legal books for Mr. Hilbery's "Critical Review." He had always made plans since he was a small boy; for poverty, and the fact that he was the eldest son of a large family, had given him the habit of thinking of spring and summer, autumn and winter, as so many stages in a prolonged campaign. Although he was still under thirty, this forecasting habit had marked two semicircular lines above his eyebrows, which threatened, at this moment, to crease into their wonted shapes. But instead of settling down to think, he rose, took a small piece of cardboard marked in large letters with the word OUT, and hung it upon the handle of his door. This done, he sharpened a pencil, lit a reading-lamp and opened his book. But still he hesitated to take his seat. He scratched the rook, he walked to the window; he parted the curtains, and looked down upon the city which lay, hazily luminous, beneath him. He looked across the vapors in the direction of Chelsea; looked fixedly for a moment, and then returned to his chair. But the whole thickness of some learned counsel's treatise upon Torts did not screen him satisfactorily. Through the pages he saw a drawing-room, very empty and spacious; he heard low voices, he saw women's figures, he could even smell the scent of the cedar log which flamed in the grate. His mind relaxed its tension, and seemed to be giving out now what it had taken in unconsciously at the time. He could remember Mr. Fortescue's exact words, and the rolling emphasis with which he delivered them, and he began to repeat what Mr. Fortescue had said, in Mr. Fortescue's own manner, about Manchester. His mind then began to wander about the house, and he wondered whether there were other rooms like the drawing-room, and he thought, inconsequently, how beautiful the bathroom must be, and how leisurely it was—the life of these well-kept people, who were, no doubt, still sitting in the same room, only they had changed their clothes, and little Mr. Anning was there, and the aunt who would mind if the glass of her father's picture was broken. Miss Hilbery had changed her dress ("although she's wearing such a pretty one," he heard her mother say), and she was talking to Mr. Anning, who was well over forty, and bald into the bargain, about books. How peaceful and spacious it was; and the peace possessed him so completely that his muscles slackened, his book drooped from his hand, and he forgot that the hour of work was wasting minute by minute. "It's about Charles and Uncle John's offer… . Mother's been talking to me. She says she can't afford to pay for him after this term. She says she'll have to ask for an overdraft as it is." It was out of the question that she should put any more household work upon herself. No, the hardship must fall on him, for he was determined that his family should have as many chances of distinguishing themselves as other families had—as the Hilberys had, for example. He believed secretly and rather defiantly, for it was a fact not capable of proof, that there was something very remarkable about his family. "If mother won't run risks—"
"I think you'd be foolish to risk your money on poor old Charles," she observed. "Fond as I am of him, he doesn't seem to me exactly brilliant… . Besides, why should you be sacrificed?" "Happiness," she remarked at length enigmatically, rather as if she were sampling the word, and then she paused. She paused for a considerable space, as if she were considering happiness in all its bearings. "Hilda was here to-day," she suddenly resumed, as if they had never mentioned happiness. "She brought Bobbie—he's a fine boy now." Ralph observed, with an amusement that had a tinge of irony in it, that she was now going to sidle away quickly from this dangerous approach to intimacy on to topics of general and family interest. Nevertheless, he reflected, she was the only one of his family with whom he found it possible to discuss happiness, although he might very well have discussed happiness with Miss Hilbery at their first meeting. He looked critically at Joan, and wished that she did not look so provincial or suburban in her high green dress with the faded trimming, so patient, and almost resigned. He began to wish to tell her about the Hilberys in order to abuse them, for in the miniature battle which so often rages between two quickly following impressions of life, the life of the Hilberys was getting the better of the life of the Denhams in his mind, and he wanted to assure himself that there was some quality in which Joan infinitely surpassed Miss Hilbery. He should have felt that his own sister was more original, and had greater vitality than Miss Hilbery had; but his main impression of Katharine now was of a person of great vitality and composure; and at the moment he could not perceive what poor dear Joan had gained from the fact that she was the granddaughter of a man who kept a shop, and herself earned her own living. The infinite dreariness and sordidness of their life oppressed him in spite of his fundamental belief that, as a family, they were somehow remarkable. "Isn't that only because you've forgotten how to enjoy yourself? You never have time for anything decent—"
"Poor Ralph!" said Joan suddenly, with a smile. "You think your sister's getting very old and very dull—that's it, isn't it?" Denham had accused Katharine Hilbery of belonging to one of the most distinguished families in England, and if any one will take the trouble to consult Mr. Galton's "Hereditary Genius," he will find that this assertion is not far from the truth. The Alardyces, the Hilberys, the Millingtons, and the Otways seem to prove that intellect is a possession which can be tossed from one member of a certain group to another almost indefinitely, and with apparent certainty that the brilliant gift will be safely caught and held by nine out of ten of the privileged race. They had been conspicuous judges and admirals, lawyers and servants of the State for some years before the richness of the soil culminated in the rarest flower that any family can boast, a great writer, a poet eminent among the poets of England, a Richard Alardyce; and having produced him, they proved once more the amazing virtues of their race by proceeding unconcernedly again with their usual task of breeding distinguished men. They had sailed with Sir John Franklin to the North Pole, and ridden with Havelock to the Relief of Lucknow, and when they were not lighthouses firmly based on rock for the guidance of their generation, they were steady, serviceable candles, illuminating the ordinary chambers of daily life. Whatever profession you looked at, there was a Warburton or an Alardyce, a Millington or a Hilbery somewhere in authority and prominence. It may be said, indeed, that English society being what it is, no very great merit is required, once you bear a well-known name, to put you into a position where it is easier on the whole to be eminent than obscure. And if this is true of the sons, even the daughters, even in the nineteenth century, are apt to become people of importance—philanthropists and educationalists if they are spinsters, and the wives of distinguished men if they marry. It is true that there were several lamentable exceptions to this rule in the Alardyce group, which seems to indicate that the cadets of such houses go more rapidly to the bad than the children of ordinary fathers and mothers, as if it were somehow a relief to them. But, on the whole, in these first years of the twentieth century, the Alardyces and their relations were keeping their heads well above water. One finds them at the tops of professions, with letters after their names; they sit in luxurious public offices, with private secretaries attached to them; they write solid books in dark covers, issued by the presses of the two great universities, and when one of them dies the chances are that another of them writes his biography. Now the source of this nobility was, of course, the poet, and his immediate descendants, therefore, were invested with greater luster than the collateral branches. Mrs. Hilbery, in virtue of her position as the only child of the poet, was spiritually the head of the family, and Katharine, her daughter, had some superior rank among all the cousins and connections, the more so because she was an only child. The Alardyces had married and intermarried, and their offspring were generally profuse, and had a way of meeting regularly in each other's houses for meals and family celebrations which had acquired a semi-sacred character, and were as regularly observed as days of feasting and fasting in the Church. In times gone by, Mrs. Hilbery had known all the poets, all the novelists, all the beautiful women and distinguished men of her time. These being now either dead or secluded in their infirm glory, she made her house a meeting-place for her own relations, to whom she would lament the passing of the great days of the nineteenth century, when every department of letters and art was represented in England by two or three illustrious names. Where are their successors? she would ask, and the absence of any poet or painter or novelist of the true caliber at the present day was a text upon which she liked to ruminate, in a sunset mood of benignant reminiscence, which it would have been hard to disturb had there been need. But she was far from visiting their inferiority upon the younger generation. She welcomed them very heartily to her house, told them her stories, gave them sovereigns and ices and good advice, and weaved round them romances which had generally no likeness to the truth. The quality of her birth oozed into Katharine's consciousness from a dozen different sources as soon as she was able to perceive anything. Above her nursery fireplace hung a photograph of her grandfather's tomb in Poets' Corner, and she was told in one of those moments of grown-up confidence which are so tremendously impressive to the child's mind, that he was buried there because he was a "good and great man." Later, on an anniversary, she was taken by her mother through the fog in a hansom cab, and given a large bunch of bright, sweet-scented flowers to lay upon his tomb. The candles in the church, the singing and the booming of the organ, were all, she thought, in his honor. Again and again she was brought down into the drawing-room to receive the blessing of some awful distinguished old man, who sat, even to her childish eye, somewhat apart, all gathered together and clutching a stick, unlike an ordinary visitor in her father's own arm-chair, and her father himself was there, unlike himself, too, a little excited and very polite. These formidable old creatures used to take her in their arms, look very keenly in her eyes, and then to bless her, and tell her that she must mind and be a good girl, or detect a look in her face something like Richard's as a small boy. That drew down upon her her mother's fervent embrace, and she was sent back to the nursery very proud, and with a mysterious sense of an important and unexplained state of things, which time, by degrees, unveiled to her. There were always visitors—uncles and aunts and cousins "from India," to be reverenced for their relationship alone, and others of the solitary and formidable class, whom she was enjoined by her parents to "remember all your life." By these means, and from hearing constant talk of great men and their works, her earliest conceptions of the world included an august circle of beings to whom she gave the names of Shakespeare, Milton, Wordsworth, Shelley, and so on, who were, for some reason, much more nearly akin to the Hilberys than to other people. They made a kind of boundary to her vision of life, and played a considerable part in determining her scale of good and bad in her own small affairs. Her descent from one of these gods was no surprise to her, but matter for satisfaction, until, as the years wore on, the privileges of her lot were taken for granted, and certain drawbacks made themselves very manifest. Perhaps it is a little depressing to inherit not lands but an example of intellectual and spiritual virtue; perhaps the conclusiveness of a great ancestor is a little discouraging to those who run the risk of comparison with him. It seems as if, having flowered so splendidly, nothing now remained possible but a steady growth of good, green stalk and leaf. For these reasons, and for others, Katharine had her moments of despondency. The glorious past, in which men and women grew to unexampled size, intruded too much upon the present, and dwarfed it too consistently, to be altogether encouraging to one forced to make her experiment in living when the great age was dead. She was drawn to dwell upon these matters more than was natural, in the first place owing to her mother's absorption in them, and in the second because a great part of her time was spent in imagination with the dead, since she was helping her mother to produce a life of the great poet. When Katharine was seventeen or eighteen—that is to say, some ten years ago—her mother had enthusiastically announced that now, with a daughter to help her, the biography would soon be published. Notices to this effect found their way into the literary papers, and for some time Katharine worked with a sense of great pride and achievement.